My background check came back today and all the paperwork was processed. I am now officially a driver for Uber. Since Uber first appeared, I was amazed by its simplicity and efficiency. In many ways, it embodies why the free market is so great: it’s challenging the political and economic power of entrenched taxi cartels, and it’s helping ordinary people improve their lives. This is why I’m driving for Uber. I don’t really need the extra money (although it never hurts). This is my way of standing up to the taxi cartels and crony capitalism. I rebel by being successful, despite the machinations of those who would stop me. You’ll notice many of the industries are lower than their previous peaks, but that is more a condition of the most recent recession, rather than due to offshoring. US manufacturing is alive and well. What Does The US Manufacture? 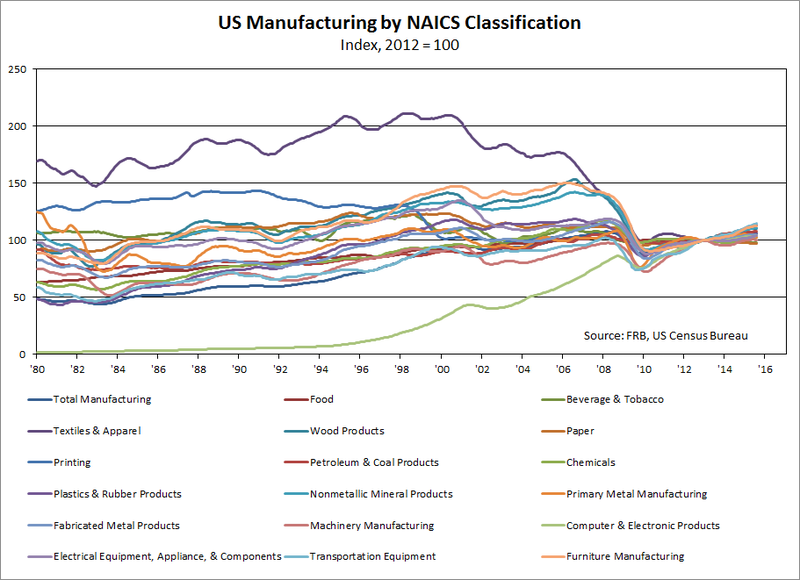 You’ll notice only 3 of the 18 major manufacturing sectors have experienced declines. Anticipating an objection of “cherry picking” I plan to upload in the next few days a graphical representation of this same table that will show the same story: US manufacturing hasn’t disappeared. But it has changed. One of the most acclaimed (and rightfully so) economic writings out there is Leonard Reed’s I, Pencil. I, Pencil contains many great economic insights, not the least of which is no one person possess all the knowledge required to make even a simple pencil. But there is another lesson here: no one person deserves the credit for the creation of the pencil. I, Pencil discusses the countless individuals, all with specialized and local knowledge, needed to build the led pencil, that that also means that no one person is totally responsible for it, either. There is very little anyone can do, regardless of how powerful and/or rich they may be, to actually control the economy. They can create incentives or impediments, to be sure, but that’s about it. The Federal Reserve can lower interest rates to incentivize people to borrow, but it still requires people to actually borrow. Congress can incentivize banks to lend to low-income borrowers, but it still requires banks to agree to it (likewise, banks can offer the loans, but someone still needs to sign on the dotted line). One must remember that no man is an island. The glorious thing about the market economy is that we all work together. Nothing would be possible without this interaction. However, most of the credit/blame for the good, bad, and ugly that may come is assigned to whatever poor schmuck is sitting in a particular chair at a particular time, whether he had anything to do with it or not. It may not surprise many of you, but I am a huge fan of the sharing economy. Not only does it allow for greater efficient use of resources, but it distributes economic power more and more to people. Have an extra room? Rent it out for a day or two. Have some spare cash? Fund a project. Have a car and some spare time? Help drive people around. There are many more examples I could cite, but they all have this in common: they put means of production, that is the ability to generate profits, into the hands of people. These gains are brought to you by capitalism, a system where innovation is rewarded and where people work together for the greater benefit of each other. In the interest of full disclosure, I have no financial interests in any of the companies I linked to above, although I am an Uber driver. UPDATE: In the comments, Peter points us to a better way of framing the above argument. Income inequality has been an on-again, off-again hot button issue in the US for several years now. There exists one method that could be easily enacted that would move to reduce the transfer of wealth from the relatively poor to the relatively rich: enact free trade. Trade protectionism in the US (that is, using tariffs, quotas, or other means to limit imports in order to protect domestic firms) is probably the largest source of wealth transfer from the relatively poor to the relatively rich. How does it work? A tariff, like any tax, raises the cost of goods imported. The goal of which is to make the cost of the imported good above the cost of the domestic competitor, so the domestic competitor now has the edge. However, who pays the price? The consumer does. Whereas before the consumer had the choice of a lower-cost item, now they do not. The relative purchasing power of the consumer has fallen, while the profits of the protected industries has risen. The owners of the firms have gotten richer while the consumer has gotten poorer. Of course, the proponents of such actions will argue the increased profits will “trickle-down” to the rest of us in the form of jobs, but it is a high cost to pay. As I discussed before, the cost per job saved from tariffs is especially high, even when factoring in the cost of welfare. In reality, most of these excess profits stay in the pocket of the business owners (after all, what incentive have they now to improve?). Another important thing to remember is that these costs are borne disproportionately upon the low-income folks. This is true of any consumption tax, given that the relatively poor spend a greater percentage of their income than the relatively rich. Last year, sugar tariffs alone cost the US consumer about $1.4 billion. For a relatively wealthy person, paying an extra $0.06/lb of sugar is not a major issue. However, for someone on a strict budget, it is. Protectionism is a double-whammy against the poor: it increases their prices for no reason, and the gains go right into the pockets of the relatively rich, increasing their income. One of the best acts the US government could take to address income inequality is to remove all tariffs right now. Former New York Yankees catcher and Major League Baseball Hall of Famer Yogi Berra passed away yesterday. Yogi was well-loved, partly because of his repertoire of funny quips (Yogisms). Major League Baseball was kind enough to compile some into a list, which I now share with you. Rest in Peace, Yogi. Thanks for the memories.